Despite beginning as a solo project for songwriter Matt Cal, Mystic Rebellion has grown into a full band now celebrating the release of new single Extra Things with not one but three shows across multiple venues. You can catch the launch and the band in full live force at the Odd Fellow on Saturday, April 28, the Indi Bar on Sunday April 29 and the Bassendean Hotel on Saturday, May 5. Mystic Rebellion is an act that combines multiple styles from more organic psych and roots foundations blended with imaginative synthetic textures and a strong lyrical message underpinning it all. 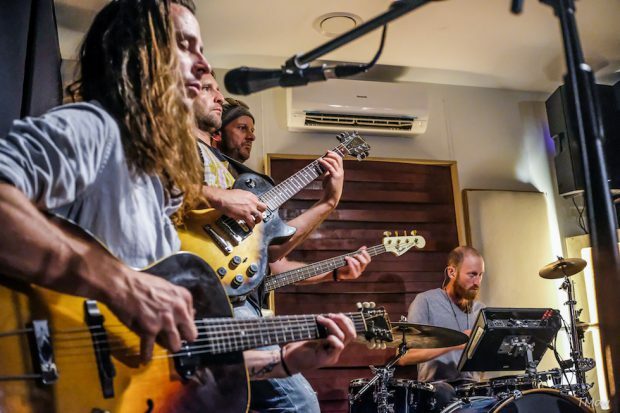 BRAYDEN EDWARDS caught up with Matt Cal to discuss how Mystic Rebellion evolved from its humble beginnings as a creative project in the back shed to a complete live band, the intriguing influences that inspired it all and where he thinks it’s going to go next. So how did Mystic Rebellion come to be? Mystic Rebellion is my rebellion against myself, breaking my mould, making music that is kinda like a secret obsession and eventually calling in some mates to see if we could make it sound live and boom…we formed a band. You played a launch show last year at Mojos but have there been any live shows since then? If not what have you been working on in the meantime? Mojos was such a sweet night of vibes and dancing but then we all went our separate ways for the summer. Luckily we were offered a Sofar Sounds show in a warehouse around town back in February and it got us all back in a room together. The gig was gorgeous, sharing the stage with Carla Geneve and Matt Gresham. 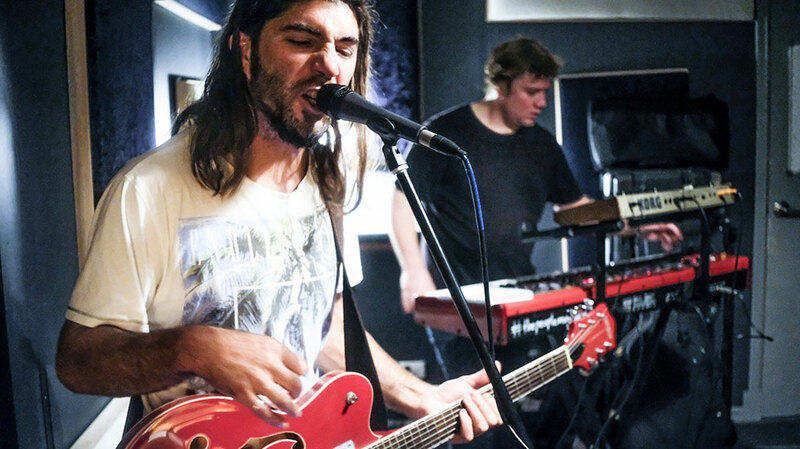 Since then we’ve been rehearsing a little, working on our craft and a couple of weeks ago we let it out at the J Shed in Freo and got our excitement into overdrive for the upcoming shows. You’ve got a run of shows beginning in late April – what’s the plan for playing these songs live and is it going to be different from the last time Mystic Rebellion played? The shows are a chance for us to get out, have some fun, give the songs some airtime and a chance to really get a feel for them live. At this stage it’s kinda my baby and I’ve etched out all the music in my back shed. The guys are adding their magic and helping me realise these sounds into the real. It seems to be a really unique blend of the electronic and organic sounds in the songs. How and why did you develop that as a dynamic? Yep, I love deep house, ambient electro, hip hop and post rock so whilst doing the solo blues and folk thing on the weekends I was carving out what felt like a very natural sound for me in my spare time in the home studio. As fate would have it, it still has that roots and psych vibe holding it all together which is amplified live by didgeridoo and some of the percussive elements amongst the synths and electronic loops and samples running through it all. I think mainly this first collection of songs that make up the set represent a bit of a journey where I discovered I could write and produce with heaps of instruments and not just an acoustic guitar. And what kind of artists do you think have inspired this aesthetic? Locally I’ve always loved Diger Rockwell and Felicity Groom for their production aesthetic while Mathas’ lyrics and flow are incredible. Internationally I can’t help but be inspired by early Spearhead records with Michael Franti and all our tribal roots gurus as well of course, by Psy Trance label Platipus Records and the like. Their vibe of soft spoken lyrics over pulsing tracks just gets me deep. Having said all that, it has been important to me to carve out my own sound and it is something I’ve been conscious of during the process. And how about the lyrics? There is some stuff that’s quite poetic and one song I heard the vocals were even delivered as spoken word. What kind of message or feelings motivate your writing? Yep the lyrics take centre stage in the recordings and I really wanted every syllable to carry weight. The single Extra Things, which we are touring this time round is a hell of a mouthful on social comment. It all began with the realisation that the more space we have the more we will accumulate stuff to fill it. It became far more than that though. I guess it’s about being human in these current times of mass production and social media. How we have to be strong in amongst it all to create change. And what’s next for Mystic Rebellion? Next for Mystic Rebellion is the finishing touches on the EP which is mainly done. Following that, keys and synth musician Matt Parker and I are talking of taking the project deeper into electronica. We both have a bunch of demos to explore and I think we could head off in a Presets v Darkside kind of direction, we will have to see. At the moment we are stoked to get out and have a couple of banger weekends playing some shows.